Cabling is essential to an effective telephone or computer network, which is why Fusion offers structured cabling as part of your IT support contract. A well-organised cabling system ensures your network is working to its full potential and makes maintaining or updating your server much easier. Structured cabling can also give you more control over your office space. We can for instance, position computers, printers and servers wherever you like and make sure cabling is hidden to meet your health and safety responsibilities. 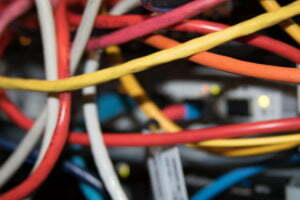 Need your cabling certifying? Fusion additionally has the experience and equipment to prove that your cabling is up to standard and keep your business compliant.